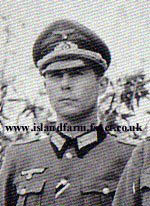 Hans Gerd was Generalfeldmarschall Gerd von Rundstedt's only child. 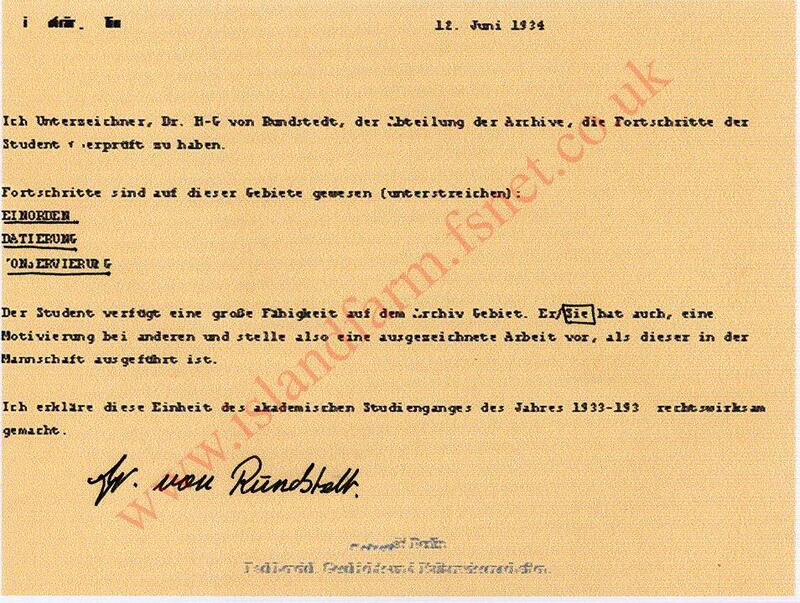 Breaking from the family tradition of soldiering, Hans Gerd von Rundstedt elected to become an academic instead. His father later said that he would have been a “lousy soldier”! After achieving a doctorate in the early 1930s, he worked as an archivist at the University in Berlin for several years. Children: Barbara (1936), Gerd (1938), Eberhard (1940), Editha (1942) and Paul (1945). 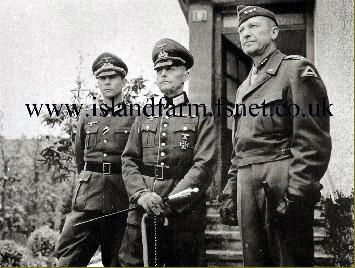 Called up for military service early in World War II, Hans Gerd von Rundstedt was assigned to the Army High Command Historical Section in Berlin where he compiled biographies of senior Army officers (including his father). After service in The Hague, he later served on his father’s staff. At some point during the war he was awarded the War Merit Cross, 2nd Class. 10 July 1945-on or about 19 October 1945, Combined Services Detailed Interrogation Centre at Wilton Park, Buckinghamshire. On or about 19 October 1945-6 January 1946, Prisoner of war camp at Grizedale Hall. 6 January 1946-17 November 1946, Prisoner of war camp at Island Farm (Special Camp 11). 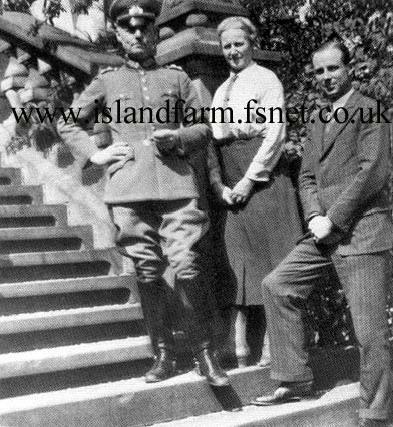 While Generalfeldmarschall von Rundstedt remained in captivity, Hans Gerd left Island Farm on 17 November 1946 after developing a throat problem. After two short stays at other camps, he was released from captivity on 30 January 1947 and returned to Germany. Hans Gerd von Rundstedt died of throat cancer on 12 January 1948 in Hannover. I came to know Hans von Rundstedt whilst he was working at the University of Berlin in the Archive Department. At the time, I think he had been a Dr. for around two years or something like that. I was still a student, but I also wished to work with archives, and so I often did courses in the archive section. Once or twice, I found myself not under his direction, as he was not the director of my studies, but I was sometimes under his supervision. I remember him as a very kind man, who was very understanding if you filed something the wrong way - not like some people who thought that if you were at that level of studies then you should automatically know how to file... He was one of those people who told you that if you had any problems with the Univeristy administration, or even if you were not sure of something, then you could ask him, and he would always do his best to help you. Then of course, he was called up for the army, where I believe he wrote a series of biographies including the one of his father. I passed my doctorate in 1939, just before the outbreak of the war. I then decided I would go and perfect my English in England, and I lived for a few years in Nottingham. I was very saddend to read in 1948 in the newspaper that Hans von Rundstedt had died, and I sent a personnal condolence card to the Field Marshall, whilst he was still at the camp in Bridgend. He actually sent me a reply too, thanking me for my kindness. If I remember correctly, he also said that had his son not been ill, he would have gone back into the Academic line of work after the war. I, Dr. H-G von Rundstedt of the Archive Department, certify that this student has made progress. The student has made a lot of progress in the Archive domain. He/She also has a lot of motivation towards others and shows a great deal of ability in Teamwork. I declare this unit of study for the Academic year of 1933-1934 validated. A progress report from the archive department of the University, which sums up the progress Helga Bischoff made over a term of studies, which Gerd von Rundtsedt supervised. Every time I met him (Hans von Rundstedt), it was never because I had to see him personally. 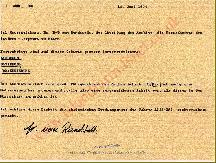 I was a member of the Gestapo, and there was a period of the war when I made repeated visits to the Public Government sections of Berlin, where the Leutnant's wife, née von Oppen, was a doctor of economics. It was with her and her bosses that I had to converse, and sometimes he was there. In Paris, it was the same. I came accross him one or two times when we had to make a search of the Rundstedt HQ in Paris. He was always very polite, but I found him somewhat annoying in the sense that he was always fussing around you and trying to please.